We recently bought a new dining table and decided to have a little party to break out the table. I had my lovely sister in law, her mum and brothers and my grandmother over for dinner. Instead of the same old, I thought I might try some Indo-chinese recipes. 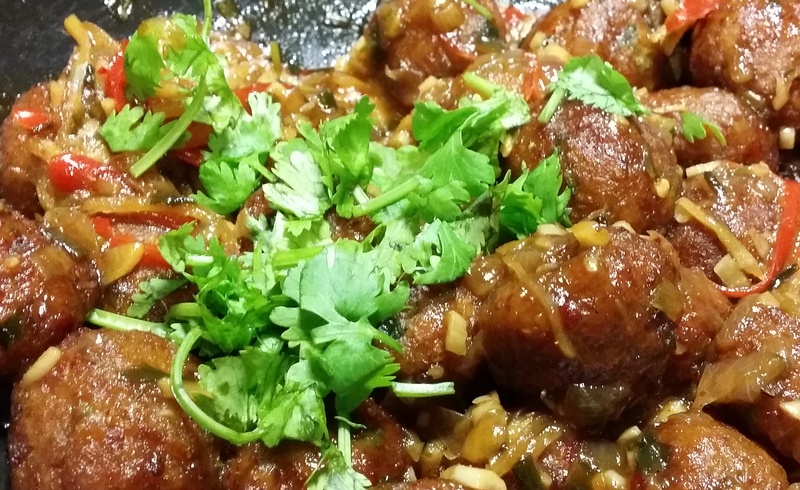 This Vegetarian Manchurian recipe was a huge hit. There is no egg in the recipe, so it’s 100% vegetarian. You could use any combination of vegetables, so be creative! In a food processor, add all the vegetables and process until finely chopped. In a hot pan, add chopped vegetables and water. Cover with a lid and allow to cook for about 5 minutes. Remove from heat and let cool completely. Place vegetables in a strainer lined with cheese cloth and press out all the excess liquid. Reserve this liquid for the sauce. To the dry and cooled vegetable mixture, add garlic, ginger, spring onion, coriander, green chillies, rice, bread crumbs and 2 tablespoons corn flour. Also add, chilli paste, white pepper, soy sauce, plum sauce and mix well. Divide equally and form into small balls. Place in the fridge to chill and firm up. Just before frying, roll the vegetable dumplings in corn flour and fry until golden brown. Make sure the oil is not too hot. Once crisp, drop the dumplings into the sauce (See below: step (b)). Heat oil, add chopped onions and salt and cook until soft and translucent. Add garlic and cook until soft. Add ginger and red chillies, add 1/2 cup stock and cook until mixture has softened. Add spring onions, coriander stems and pepper. Stir well. Add soy sauce, mirin, plum sauce, Maggi seasoning and chilli paste and check seasoning. Manchurian sauce should be well balanced, sweet, spicy and a little salty. If mixture is too thick, add a little more stock. Before serving, bring sauce to a boil and gently add vegetable dumplings, stir well, garnish with chopped coriander leaves and serve hot with rice. Enjoy!